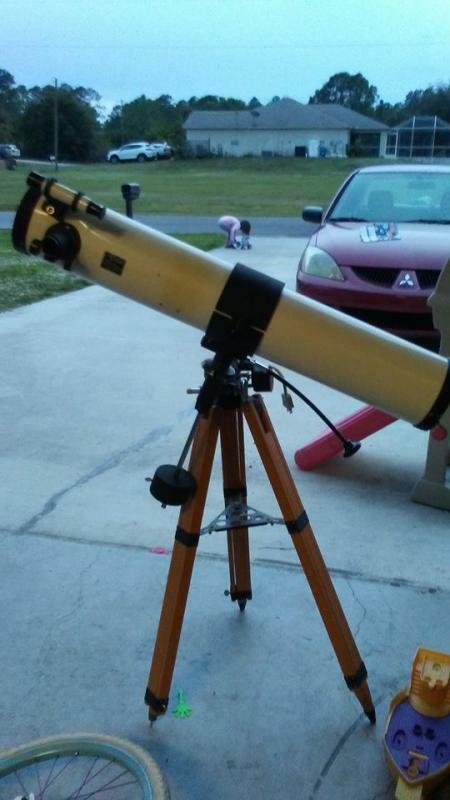 We are looking for a telescope for our 8 year old (just posted last week for advice) and I guess one neighbor told another because she walked over with one tonight and said it's ours. She gave the impression she has no clue how to use it and said she hopes we can figure it out. I am JUST starting to look into what types are how to find one for us, and not looking into how to use them just yet, so I thought I would come here for help. I think one dial has to be set to latitude or longitude and another to something else... I don't know... It moves in all kinds of directions and I was able to use the 40mm eyepiece tonight to see into my neighbor's garage. They were with me in hopes I would figure it out. But it's super cloudy tonight too, so there was nothing in the sky to see. We have tons of stars on a clear night though. Here is a pic of the scope and the lenses and other things. I don't know how to use any of it... yet. Thought I could get some pointers on what I have, is it any good, are the lenses any good, and what the other things are. Maybe a link to a good video on how to set it up. I looked up the specific scope and all I found was a long video of a guy with the same one, giving a review and it wasn't in english. Thank you in advance for your help!! I numbered things to be helpful. #1 I don't know what this is, it also says around the black rim "Quantaray 55mm OMC-1A Japan". almost every piece says Japan). #4 is a lense "AH. 40mm"
#7 I have no clue what this is or how to use it. says "T-NF Japan"
#8 has a mirror inside it and I'm sure it's something for the reflecting or something but again, no real clue what it is or how to use it. ALSO not in the picture... on the bottom of #6 I realized is a piece that screws off and is similar looking to #2, but says "MOON" on it. 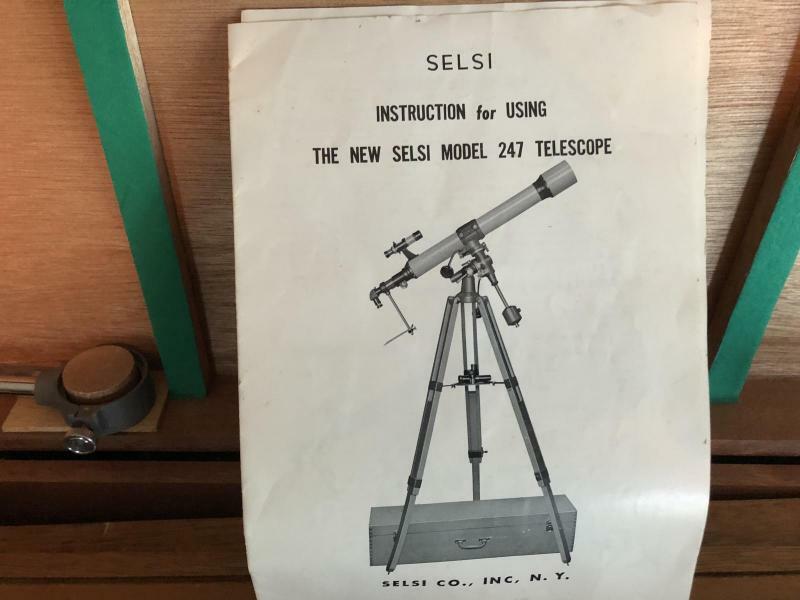 Selsi astronomical reflector telescope with wooden tripod. Hello Jaclyn and welcome to cloudy nights! First this might be a good telescope. Selsi made some good products long ago. First take off the front cover, and look down the tube at the main mirror. Is it there? Is is somewhat shiny or covered with dust, mildew, spider webs ??? If it is shiny we are good, if not we will have to clean it. can see your eyeball looking back at you. slip into. I don't see that in the pic. Maybe??? it is not needed on this scope, or maybe it is missing. 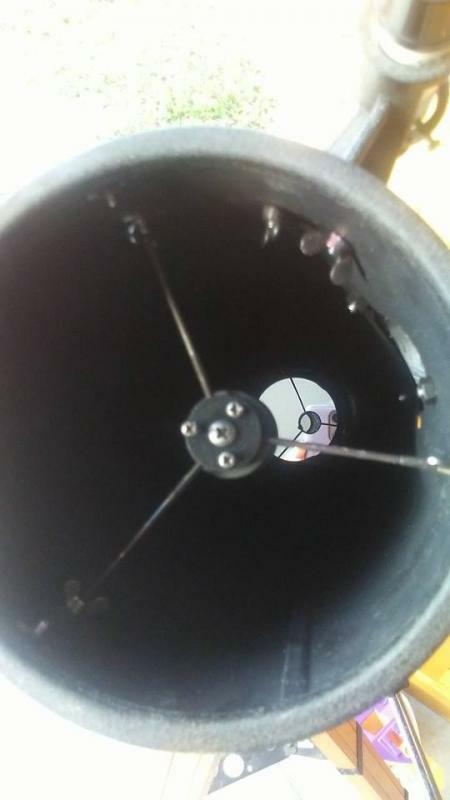 Does one of the eypieces fit down the focuser tube? Or mabe it might fit too loosely. Assuming we get over that hurdle, lets move on. The tripod looks "awkward" thight/loosen the nuts, bolts and get it all square. and in small circles so that you can see the same object in the main scope. You will have to practice focusing it here. main scope. Now the finder is aligned. If you are lucky you don't have to do anything. Just a few more things and we are done. On the telescope black mount usually there is a scale called the latitude scale. It will have numbers between 0 an 90. You need to loosen the nut that holds the telescope stiffly, and set this scale to read whatever latidude you are on the globe. For example I live in Chicago, I have mine set to 42 degrees. When you are ready to observe. Set the scope down and get it as level as you can. Now the part of the mount that juts outs and holds the weight, point that part North as best you can. BTW this is call the right ascension or RA axis. I would recommend you view the moon first. It is easy to find and very cool. freely. Use the finder to get the moon in view. Tightn the thumb nobs. One again use the eyepiece with 40 on it. you can track objects easily. One will turn RA axis. Turning this knob will keep the telescope on the moon. Once you get the hang of it you can try the other eyepieces. This is not hard, but not not easy either. Write back if you have other questions, or are confused by what I have stated. You are the proud owner of what today would be called a 113mm f/8 Equatorial Newtonian Reflector. Looks like she has some age on her. You seem to have 3 eyepieces, a Barlow lens (the long thing the fingers are holding), a moon or lunar filter, some larger filter(don’t know), a diagonal (don’t know why that would come with a Newt), and I what may be a projection eyepiece (but I’m not at all sure). The mount is called a German Equatorial. Probably the easiest path is to try to find an astronomy club in your area and bring the telescope to one of the meetings. I'm sure there will be people happy to help you get started. 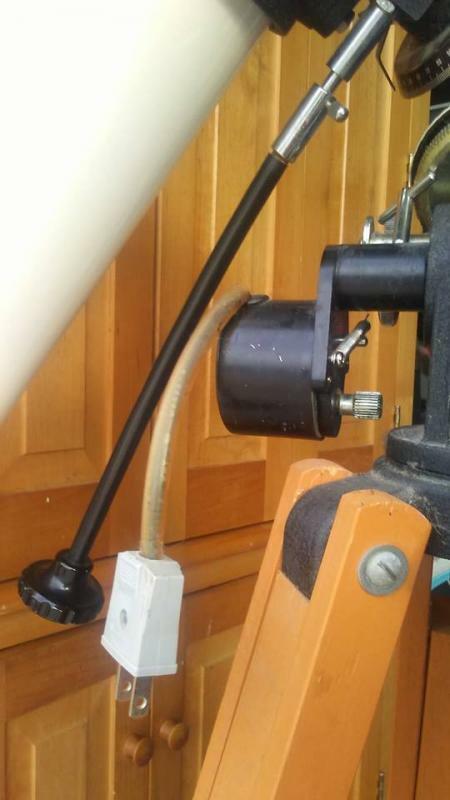 The telescope is on a German equatorial mount (GEM). They aren't the most intuitive, but with some instruction and a little practice, it can become second nature. Sometimes, those mounts can be set to function as an alt-az mount that is much easier to use. YouTube has a lot of videos on how to use GEMs. What is the diameter of the eyepiece barrels? Older Japanese-made telescopes usually have 0.965-inch diameters, while the current standard is 1.25-inches. But since it comes with eyepieces, that shouldn't be an issue for now. Answers to your questions in red. #1 I don't know what this is, it also says around the black rim "Quantaray 55mm OMC-1A Japan". almost every piece says Japan). I don't know either. My guess is that it is a lens filter for a camera and doesn't belong with the telescope. #2 I don't know what this is This looks like a colored filter (green?) It screws into the end of the eyepieces and it is used when observing planets. Sometimes a colored filter will make surface features on a planet easier to see. You don't need it for now. #3 Janson 2x barlow (I know this is used to magnify even more but no clue how to use it.) The Barlow multiplies the apparent magnification. You put the Barlow in the eyepiece holder and then place the eyepiece into the Barlow. You don't need it right now because you have three different eyepieces for low, medium and high magnifications. #4 is a lense "AH. 40mm" This is your low-magnification eyepiece. #5 lense "H20mm" This is your medium-magnification eyepiece. #6 lense "SR4mm" This is your high magnification eyepiece. #7 I have no clue what this is or how to use it. says "T-NF Japan" I don't know either, but it doesn't look like it belongs to this telescope. You don't need it for now. Maybe someone more experienced can ID it. #8 has a mirror inside it and I'm sure it's something for the reflecting or something but again, no real clue what it is or how to use it. This is a diagonal and it is used with refractor telescopes (yours is a reflector), so it doesn't belong with this telescope. ALSO not in the picture... on the bottom of #6 I realized is a piece that screws off and is similar looking to #2, but says "MOON" on it. You can unscrew this from the eyepiece. It is used for looking at the Moon because the full Moon is so bright, it is hard to see details. It is a deutral-density filter that cuts down the light. Take it off for now. You can try with and without it when you look at the Moon and see which configuration you like better. Edited by cookjaiii, 29 November 2018 - 09:33 PM. I'm going to move this to the Classics area. 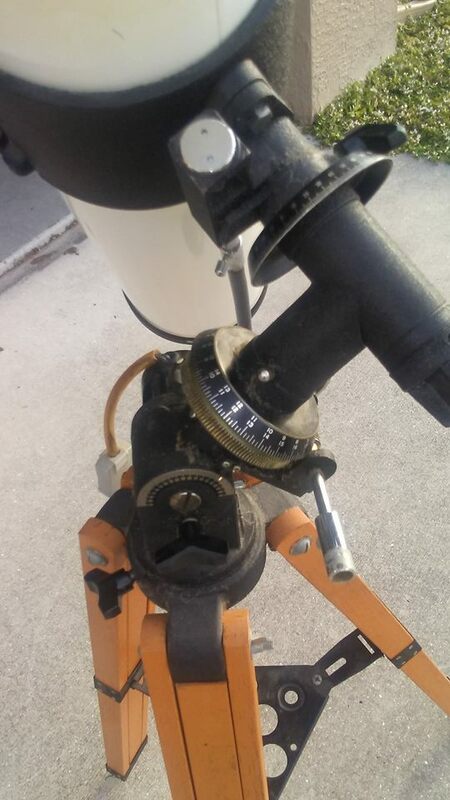 It is a very old scope and some of our collectors can probably give you some pointers on setting it up and using it. It can be challenging since this is really old school stuff. But if the mirrors are good, you can possibly get some nice views. 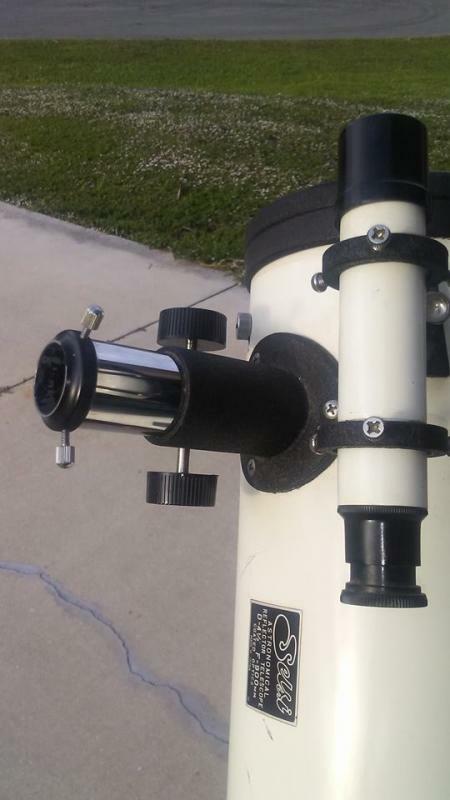 I have a Selsi Refractor of similar vintage and I'm very pleased with the build quality. 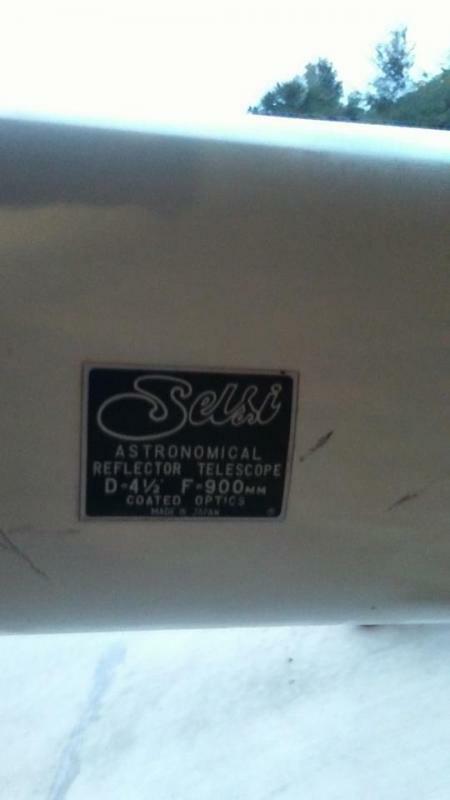 You have a Newtonian Reflector made by TOWA in Japan re-branded as a Selsi, probably in the 1970s. These use a large mirror near the bottom to create the image, and a much smaller mirror near the top that bends the light out through the focusing mount & to the eyepiece. These generally have very good mirrors. They need to be clean & correctly aligned to produce their best views. #7 looks to be a telescope to camera "T" adapter....Nikon F lens mount (T-NF)....for astrophotography. Edited by otocycle, 29 November 2018 - 10:01 PM. If there is a Library or Museum nearby, ask them if they know of any local astronomy clubs. I'm sure one of their members would be more than happy to show you and your daughter how to setup and use that telescope. Well, that is a heck of a deal - nice! One thing I noticed, in your second image - there looks to be a 110v plug dangling there, which means that the mount has a tracking motor. Can you get a better picture of that for us? The main reason being, you might not want to go twisting the slow motion control knobs on that part of the mount - without first knowing if there is some form of clutch mechanism to disengage the motor. I'm not familiar with this one, but you could end up damaging the motor, or a gear depending on the way it works. 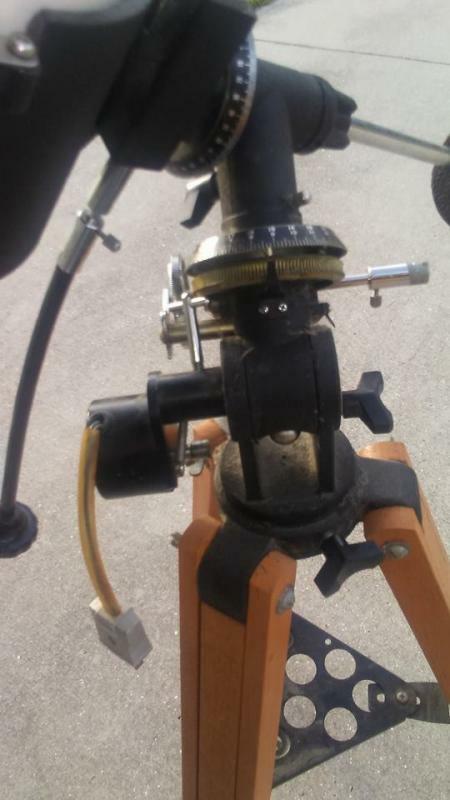 Also, post #2 from vtornado mentions the eyepiece holder, which hopefully you have - but it appears missing or perhaps it's the angle of the photo. More pictures would help give you a better idea on those things, and there are many here willing to help you with it. And also, one thing to keep in mind - even if it is an older scope, that does not necessarily mean that a newer one of similar design would be better .... sometimes (maybe more than sometimes)) it's the exact opposite. #1 is a skylight filter that screws onto a camera with 55 mm diameter filter thread. Not part of the telescope. 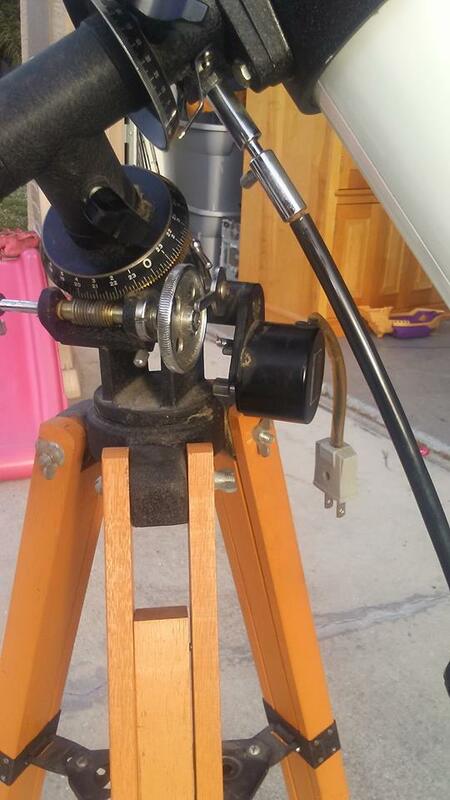 #8 is a right angle diagonal and may be part of this telescope. It is used for projecting an image of the sun. In one of the pics posted above, you can see it installed on a refractor telescope, and aimed down at a small white screen. Spending a little time on Youtube will get you familiar with the instrument. Try this one: https://www.youtube....h?v=Y2sIZGdL8Tc. It's a good video with a scope very much like yours. Setting up the mount is relatively simple. Aligning the optics is much harder. There aare numerous Youtube videos also, including some that discuss mirror cleaning. Others know far more about that for me so follow their advice but I mention this because two weeks ago my friend came to visit after going to our local rural garbage dump and in the free store there he found a slightly beat up but still workable Celestron AtroMaster 76mm (f9.2) reflector that he gave to me. It's on a similar size eq mount to yours but not as pretty - love those wooden legs. I've never had a lot of time on eq mounts so I'm not only thrilled to get this scope for free (which I'll fix up for the 5 y.o. granddaughter to use) but I now have an eq mount to play with and learn to use but it can still use alt-az mode for quicker looks when I may not need tracking. Anyways, with a bit of patience and elbow grease I think you've got a potentially very fine scope that will show you a lot of things. I recommend the M45, the Pleiades, as an awesome first target - easy to find and a beautiful object at any magnification. And the Moon of course and just general sweeping through the Milky Way at low magnifications - some nights that's all I do as it's always so beautiful. Clear skies. IMPORTANT THINGS NOT TO DO! 1. Never ever point this near the sun without a "solar filter" that fits over the large end. 2. Never ever use something that looks kinda like a flat washer with dark glass in the center label "sun" to look at the sun. As a child you probably were impressed when someone started a fire with a small magnifying glass simply using sunlight. This telescope has a larger 4.5" optical mirror, and can burn human beings (not a whole human being, but parts of us) and eyes very fast. Or start fires. 1. Do not attempt to clean either mirrors or eyepieces before reading up on how to do it. It is very easy to scratch mirrors, which messes them up. Read up, watch videos and gather all necessary tools and distilled water before starting. Enjoy your new telescope. 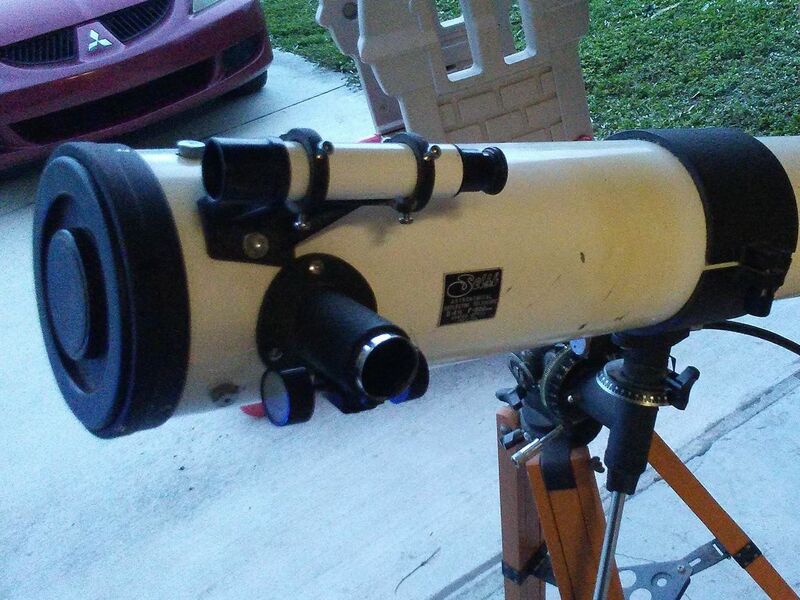 Assuming it is working or can be refurbished, this scope can show a lot of the sky, planets, nebulas, the moon, etc. Edited by Littlegreenman, 30 November 2018 - 12:34 AM. Jaclyn, first, welcome to Cloudy Nights! Best from me: Can you post what town or area you live? Easiest thing here, I think, would be for one of us who lives locally to you to meet up with you and your scope...... in 15 minutes, a person familiar with scopes can have yours checked out and probably up and running and answer a hundred questions. Best thing is, if your scope is in reasonable shape and complete, or parts can be found (not hard), you will have a very nice scope likely equal in performance to anything of similar size you can buy new today. I am from the outskirts of Ft. Myers, Florida. Right where the country starts. 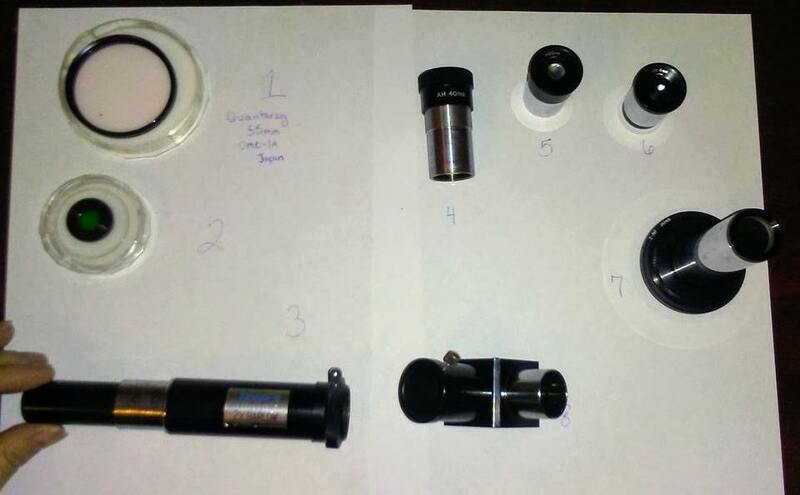 I DO have the circle piece that goes on the eye piece of the telescope (forgive me for being bad with names of parts!) I took pictures yesterday while we still had a little light, then tried to just see if I could spot anything and I could!! But in that process I figured out that part was missing and lenses were not fitting, very loose. The ring was on the bottom of the barlow and I put it back on the scope. (pretty sure I found the right piece) and then later took pictures of the parts which I posted, so by then the circle piece was back on the scope and wasn't in any pictures... I didn't think to mention it before. I took better pictures of the mounting area (not sure what to call it) with all the circle things and the plug. I would have no idea where to even begin with that plug and a tracking thing of some kind if that's what it is and if it's working. My next step is to find someone local or a club I think. It would be very helpful to have someone able to show and point out things to me. But I do plan on just trying to look at a far away object today during the daytime just to see how it does! It seems like everything should be here for it to work as far as I can tell. 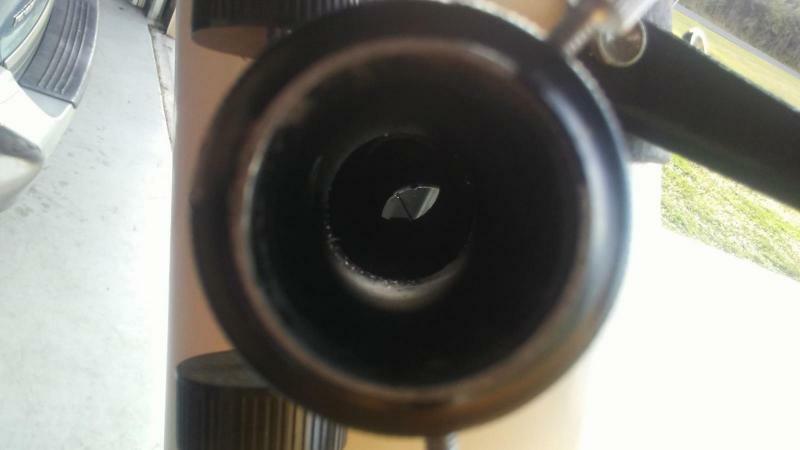 The scope needs "collimation" (optical alignment). This is a job that you'll soon be able to do on your own. There are plenty of instructions on how to do this on-line but it would be best to have some help at first. The good news is that the mirrors look to be in good shape and not real dirty. You should see if the small "finder" telescope points to the same place as the main telescope. You adjust the six little thumb screws around the finder to zero it in. One thing to do is simply carefully loosen off the clamps around the scope and slowly the scope by about 45 degrees so that when you stand at the front of the scope looking "down" at it the focuser and eyepiece are pointing at your head/eyes. Seems simple but I see the focuser is horizontal and that is not the best or generally used position. Tighten the tube clamps up again afterwards. Q: Did the scope come to you like that ??? Just wondering if the previous tried it like that always and purchased a diagonal for better positioning. You should not need a diagonal and I expect one is unusable owing to the extra path length. For now and until more experience put the filters and all bits other then the 40mm and 20mm eyepiece in a box and leave them for now. Use the 40mm for now and when you feel like it try the 20mm, personally I suggest forgetting the 4mm. The "H" on the eyepieces stands for Huygens, a now somewhat old eyepiece design. But they will work for now. The mount is going to be the fun one to get familiar with. For initial and first use you have to aim the rotational axis of the mount (not the scope) at (more or less) Polaris. By rights if you level the mount then have the latitude scale set to your latitude about 26-27N. Looking at the mount images not sure you have a latitude scale, basically cannot see one specifically. Only place I know in Florida is Boca Raton (nice ice cream shop there) so will leave it to you to dig through. Will suggest you add Ft Meyers FL to your signature, just makes it easy for people. Seems like a nice scope, cannot be a bad one as it cost nothing and I seriously expect you will get a lot out of it, you may need to consider 3 or 4 plossls, nothing expensive. Maybe 40mm, 25mm, 12mm and another. They can wait however. Just get used to the scope and playing with it all. Locate a club - one was suggested earlier - and hopefully someone will help you out. Actually expect a few people will throughly enjoy having the chance to play with that scope and show you things. Here it would be a bit of a fight to get to set it up and demonstrate it. Leave all ideas of "collimation" out of it. That comes later, just use the scope and learn. So if it appears doable align finder and main scope. Then to view the heavens 40mm eyepiece, rotate the scope a bit, work out which chunk of metal you aim at Polaris (I can see the bit that it is but unable to clearly describe it) and off you go. Try the moon, you do not need a moon filter in reality. May I just say, I am jealous, I would love to tinker and learn from an old GEM scope like that. My uncle has a similar, although newer, scope like that sitting in his living room. Just sitting. He says "it doesn't work anymore." 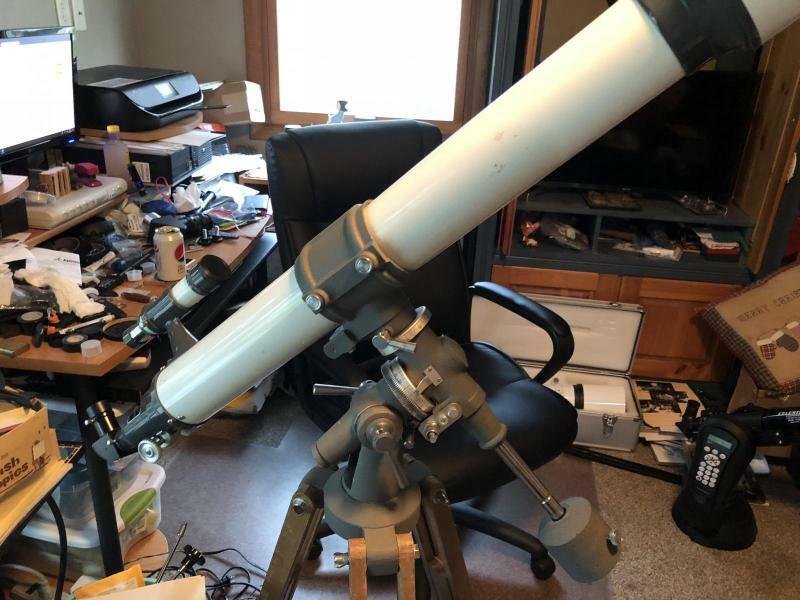 I think I will ask if I can take it home for a week or two to hopefully get it going and learn how to use an equatorial mount. Boy I sure made the right choice in moving this thread here. You guys are great!! Thanks to you all for helping her get started with that neat old scope. You get a gold star for taking some nice pictures of what you have. This helps us help you! Above I warned about not pointing this at the sun. Most telescopes can be used to observe the sun safely. It requires a "solar filter" that fits over the front open end of the tube that only allows about 1% of the sun's light to enter into the telescope. But, that would be something to consider after you get it up and running. Edited by Littlegreenman, 30 November 2018 - 11:48 AM. Highly recommend you have a club member check out the scope before trying to use it. Edited by Napp, 30 November 2018 - 12:04 PM. This classic goes all the way back to when your telescope was new and covers a lot of the whys and hows and I got my first copy at age 10 when I was starting out. Edited by davidmcgo, 30 November 2018 - 11:59 AM. From my above post several things are more clear now. Mirrors look relatively clean nothing to do here. set this to 27 degrees. I would remove the motors from the scope, for now. slow motion controls. For starting it is better to use the manual knobs. I do see the black top on the focuser in the pics nothing to do here. I did forget to mention one thing in my starter notes. You should balance this scope. Loosen one axis with the thumb screw. loosen the clamp on the scope and push the scope a little forward or back. Once you have it close, tighten that axis and move to the other axis.